I've been thinking of making a fig and walnut loaf for awhile and finally got around to trying it this week. It turned out very well and it's a formula I'd like to tinker with again. I build a little extra levain as a bit gets stuck to the side of my container. I end up adding as much as I can scrape out easily. I held back about 75 grams of water to help with the addition of the levain and salt. In the end I probably left out about 15-20 grams, though a little got added with the turns when I wet my hands. The dough probably could have handled the full amount, but I wasn't sure how the figs would play into the mix so I decided to be conservative. This made two loaves (the batard shown here and a boule not pictured -- being gifted. This is probably one of my favorite loaves to date, hearty and flavorful. I really like the purple color walnuts bring to the game, and there's just enough figs to bring a touch of sweetness. If anything I'll add a touch more figs next time. The crust is crackly and thin, just how I like it. The loaves did color quickly, so I ended up dropping the oven temp to 425F for the last 10 minutes or so. That is one lovely loaf. Thanks Lechem! Will be making this one again for sure. Great crust and I love the crumb colors! Thanks Pal -- I love that purple swirl too! 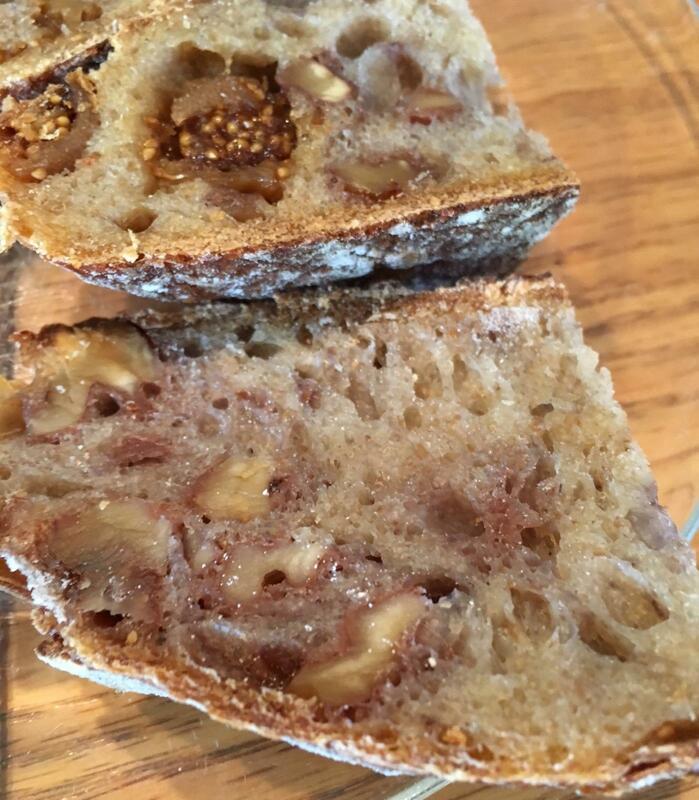 Gorgeous bread and a great flavor combo with the figs and walnuts. I wonder how a bit of orange zest would play with the figs and walnuts? Thanks Paul! I definitely think there's a lot of room to play with the flavors here, and orange zest sounds like a great idea! I think a bit of honey or brown sugar could also work nicely, or even some thyme or fennel seeds. So nice. Would you mind if I featured this on the homepage for a bit? Thank you Floyd -- I'd be honored! Well done. I love the purple from the walnuts it looks awesome. I've made a fig and pecan loaf before so I'm sure this one is delicious. Walnuts and figs are two of my favourite things! Love the clear handwritten note too! Congratulations! It's a great combo! And thank you -- a lot of my bread notes are scribbled on the backs of envelopes so decided to start being better about writing the good formulas in a notebook where people are less likely to toss them out! I am totally making this one day! It looks fabulous and I bet it tasted great! It would be amazing with some Brie! Love the purple the walnuts lend to ths bread! Thank you dab -- I was surprised that it didn't tinge the entire crumb purple, but I guess I didn't use a huge amount of walnuts. In the end I think the swirl effect was a nice surprise! Thanks Hester -- I guess I'm more proud of this "child" than some of the others, haha. Thanks Alan! Your baguettes are on my new year list of things to bake. Fingers crossed! in your future criminal baking activity ;-) . None of the baguettes are mine other than that I baked them. My approach in general is to find something that piques my interest - usually with not much more than FW&S as components. And especially if I can't find reference to them being made as baguettes, which is a fun part of the interest for me. And then alter the base formula just enough (or something a lot more than "just enough") to make them "my own". But really, they are creations from other's kitchens as very little of what is out there is truly original. As I've stated before on TFL, I'm a copy-cat baker, and once I see that "object of my desire", I may give it a go. Now if you want to use what I publish here on TFL as inspiration or ideas, please have a go at it. And if you want to bounce a thing or three off me, then by all means, please do so. And once you bake them...they will be your own baguettes too. Walnut variations are some of my favourites. Have you ever tried grinding some toasted walnuts as fine as poss, and adding it to your levain? I think this seems to create a deeper walnut-purple tinge (though I may just be imagining things). If you've not done this before, I recommend doing this with a pestle and mortar. Electric grinders struggle with the oiliness of the nuts, in my experience. That's a great idea, Monkadelic -- I haven't tried that. I would guess that the color would get more distributed that way. You added that straight to the levain? Did you notice any effect on the fermentation? I agree, walnuts are delicious and versatile in bread. One of my favorite additions as well! Sorry for the late response. Yes, I toast and then pulverise some walnut pieces and mix it with my usual wheat starter, along with some wholemeal rye. I'll usually do that at night and then mix the dough when I get home from work the next day. That morning, if the levain is already looking mighty airy, I'll whack it in the fridge for the day. I then toast more walnut pieces to include whole in the dough. Before going in the oven, the raw dough is a glorious purple-grey. An alternative is Andrew Whitley's fruit and nut loaf. Includes brazils, cashews and hazelnuts, along with figs, dates and prunes. It's gorgeous on its own, but even better when made for the cheese board. Wow that looks really very nice loaf! I have never used figs in my bread but have to use them during the holidays. The crumb looks so good that I would really like to taste it. Thank you Joc -- it was my first time adding figs to bread and it certainly won't be the last. I know some people soak them in wine too, for an extra-festive punch! I could not resist and because I was baking for a home party I just did it. I was expecting more sweetness flavor from figs but it was actually was very mild so this bread can be eaten in combination with many toppings. Next time I will soak figs in wine or maybe even rhum. Thanks so much for trying the recipe! Yes, this is a very versatile loaf as is! When I want a sweeter loaf I think I'll double the amount of figs and add a touch of honey. Hope you and your guests enjoyed the bread! Looks great. Wow, that's a gorgeous loaf. Nicely done! Thank you! It was certainly a fun and slightly decadent bake! Love the combo of flours and flavors you used and your crumb is perfect. Thank you Ian! This is becoming a favorite flour combo for me -- hearty and complex. Happy holidays to you as well! Congratulations on fine looking bake and when it looks this good it has to taste equally as good. I see that you used red fife flour, an ingredient unknown to me until now. Sometimes I get hung up on not having a specific ingredient. How big of a role did the red fife flour play in the final outcome; is it a must have ingredient? Thank you Baker Frank! I don't think Red Fife is essential to the recipe -- you could certainly replace it with whatever wheat flour you have available. I do love the nutty flavor and color RF brings to the mix, but I'm also all for using what you have. Happy baking! I want to make this tomorrow. One step calls for “Buck” or “Bulk” around 4 hours with 3 folds. I’m not sure what Buck means? And when you say three folds do you mean to fold it 3 times during the four hours or 3 times at the end of 4 hours? Thanks! 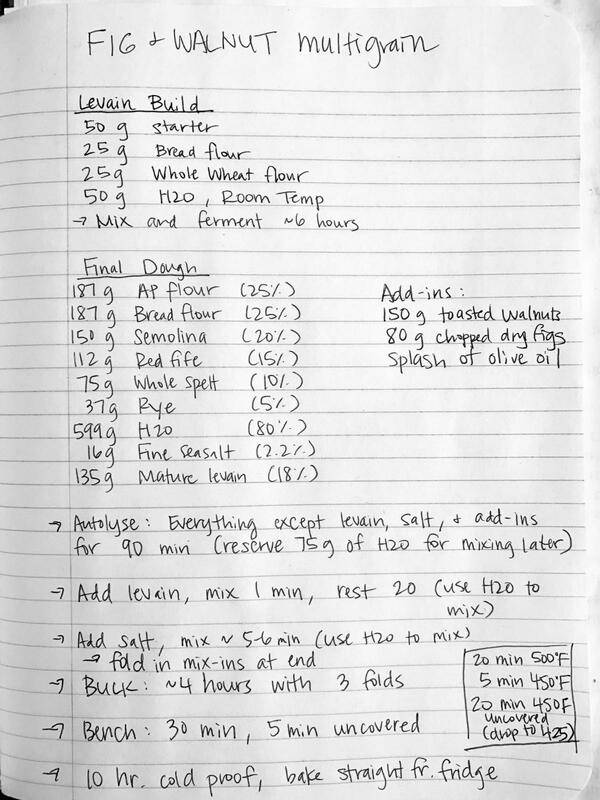 It's bulk fermentation for 4 hours with 3 folds (every 30 - 60 minutes for the first part). You may have to adjust for your environment and dough strength, but that worked for me. The dough should feel quite airy and strong by the end. Happy baking! I've got some fig yeast water getting ready right now, going to give this a shot when the water is ready. Great looking loaf. I have a strong feeling that I'll be trying that very soon. It won't look like yours, though. That's just beautiful. Hi- I am inspired by your loaf and am planning to make it soon. I have been experimentinfpg with different baking methods, and want to know if you baked this in a pot, and if so, if you preheated the pot before baking? This particular loaf I baked on a stone, covered with a foil roasting pan for the first 20-25 minutes. I've baked similar loaves in a cast iron pot too, and it works fine. Yes, I'd preheat it along with the oven. I usually take it out of the pot and finish on a stone after the first 25 minutes because I prefer a thinner bottom crust, but that is personal preference. Happy baking! Thanks for your very quick response, rushyama! I am planning on making your formula today, baking the bread tomorrow. I hope that it turns out as well as yours. rushyama- I thought I will send you pictures of my results. Thanks again. The bread is delicious! I did not have any of that special red fife flour, but substituted white whole wheat for it and it worked just fine. Sorry for the large size of the sliced bread. I am not very good at uploading pictures properly on this site. It is funny that you assumed the. Read was buttered. It must have been the light hitting the "sparkly" crumb! I usually do not eat butter with fresh-baked bread because it is usually so good just plain, though I am sure butter would guild the lilly. Thanks again for your formula. The only thing I might do differently next time would be to scale it up a bit to get a larger yield, even though my household size is two. I do feed my freezer often with my bread "experiments." I am going to try this recipe....it looks awesome and I love this type of bread with my cappuccino in the mornings. I made one similar to this but I used dried apricots, figs, dried craisins and walnuts, all were chopped into small pieces. It has great crumb, taste and was very hardy.